This was an eagerly awaited return to the stage for Kenney Jones. There had been much talk about this new band, not least through two extensive Daily Telegraph pieces and 2002's It's All About the Children single. 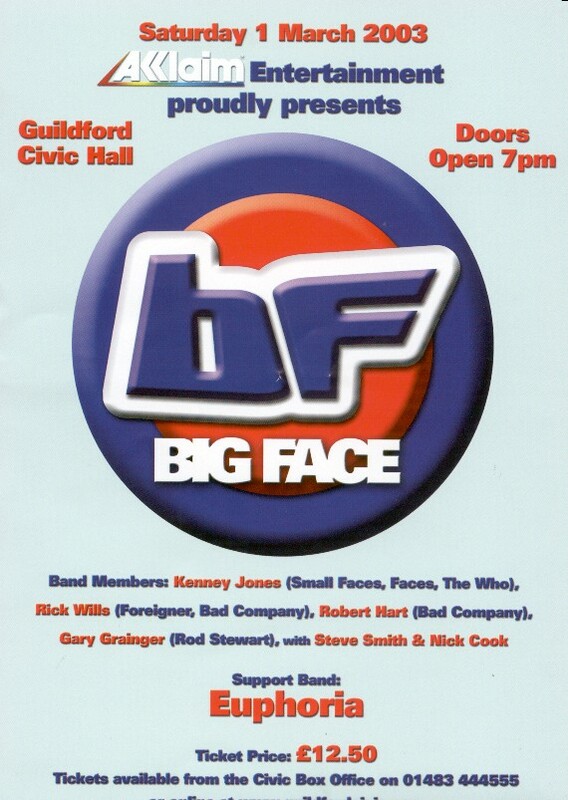 As the first gig this was a chance to play together for the first time and the set consisted primarily of cover versions, albeit mostly from the former bands of Big Face members. Strangely, the multitude of Who tracks were from the pre-Kenney Jones days rather from It's Hard and Face Dances. Not surprisingly, such an experienced line-up has an impressive list of friends. Jim "Nick Nick" Davidson introduced the group and added to the percussion for the last two numbers. Damon Hill, former World Formula 1 Champion, proved himself to be a more than competent guitarist on 5:15, where he took the solo, Won't Get Fooled Again and All Right Now. The final guest was John Lodge of the Moody Blues who played guitar on Chuck Berry's Sweet Little Rock & Roller although one suspected he would have preferred to have taken over Rick Wills' bass. So this was a superb debut from Big Face. Apparently there is to be a US tour at some point this year and, hopefully, they will undertake some more UK dates as soon as possible.